Various short term and temporary jobs including farmer, real estate salesman, carpenter, ranch hand. Ten months of service in the Army. After a federal trial in 1997, Nichols was convicted of conspiracy to use a weapon of mass destruction and eight counts of involuntary manslaughter for killing federal law enforcement personnel. He was sentenced to life imprisonment without the possibility of parole after the jury deadlocked on the death penalty. He was also tried in Oklahoma on state charges of murder in connection with the bombing. He was convicted in 2004 of 161 counts of first degree murder, including one count of fetal homicide;  first-degree arson; and conspiracy. As in the federal trial, the state jury deadlocked on imposing the death penalty. He was sentenced to 161 consecutive life terms without the possibility of parole,   setting a Guinness World Record,  and is incarcerated at ADX Florence, a super maximum security prison near Florence, Colorado. He shares a cell block that is commonly referred to as "Bombers Row" with Ramzi Yousef, Eric Rudolph, and Ted Kaczynski. In 1990, Nichols married a 17-year-old girl, Marife Torres, from the Philippines whom he met through a mail-order bride agency. When she arrived in Michigan several months later, she was pregnant with another man's child. The child died at age two when he suffocated in a plastic bag  while Nichols was babysitting him. Marife suspected foul play, but there were no bruises or signs of trauma to the child. The death was ruled accidental. Nichols and Marife had two more children during their marriage. Nichols and Torres frequently visited the Philippines, where she was working on a degree in physical therapy. He sometimes traveled to the Philippines alone, while she remained in Kansas. Florence ADMAX USP, the supermax security prison where Nichols resides. The penalty phase of the trial started on June 1, 2004. The same jury that determined Nichols's guilt would also determine whether he would be put to death. During the five-day hearing, 87 witnesses were called including victims and family members of Nichols. Nichols's relatives testified that he was a loving family man. During the closing arguments, the prosecutor argued for the death penalty, stating that 168 people had died so that Nichols and McVeigh "could make a political statement". The defense argued that Nichols had been controlled by a "dominant, manipulative" McVeigh and urged jurors not to be persuaded by the "flood of tears" of the victims who testified. The defense also said that Nichols had "sincerely" converted to Christianity. After 19½ hours of deliberation over a three-day period, the jury could not reach a unanimous decision on the death penalty. With the death penalty no longer an option, Nichols spoke publicly for the first time in the proceedings, making a lengthy statement laced with religious references to Judge Steven W. Taylor. Nichols also apologized for the murders and offered to write to survivors to "assist in their healing process". Judge Taylor called Nichols a terrorist and said "No American citizen has ever brought this kind of devastation; you are in U.S. history the No. 1 mass murderer in all of U.S. history" and sentenced Nichols to 161 consecutive life terms without the possibility of parole. Nichols was returned to the federal prison in Colorado. ^ "Amended Information, The State of Oklahoma vs. Terry Lynn Nichols" (PDF). Find Law. March 1, 2001. Retrieved April 12, 2010. ^ a b c d e f g h i j k l m n o "Key Players: The Accused: Terry Nichols". Fox News. Fox News. June 11, 2001. Archived from the original on April 14, 2008. Retrieved April 10, 2010. ^ Time Daily (December 23, 1997). "Charges Against Terry Nichols". Time. Retrieved April 13, 2010. ^ a b c d e "Terry Nichols gets life without parole: State murder counts tacked on to earlier life sentence". MSNBC. Associated Press. August 9, 2004. Retrieved April 10, 2010. ^ a b c d e f g h i j k l m n o p q r s t u v w x y Rimer, Sara (May 28, 1995). "The Second Suspect -- A special report. ; With Extremism and Explosives, A Drifting Life Found a Purpose". New York Times. Retrieved April 11, 2010. ^ a b c d e f g h i j "Terry Nichols Biography (1955-)". Biography.com. Archived from the original on December 7, 2008. Retrieved April 10, 2010. ^ a b Kenworthy, Tom (June 5, 1998). "Nichols Gets Life Term for Oklahoma Bombing Role". Washington Post. Retrieved February 26, 2009. ^ "Nichols Guilty of Conspiracy and Involuntary Manslaughter". NPR. December 23, 1997. Retrieved April 10, 2010. ^ a b c d e f g h i j "Terry Nichols guilty on 161 murder counts in state trial". Crime & Courts. MSNBC. Associated Press. May 26, 2004. Retrieved April 12, 2010. ^ a b c d e f g "Jury deadlocks, sparing Nichols from death penalty". CNN. June 11, 2004. Retrieved February 26, 2009. ^ a b c d e Shore, Sandy (September 21, 1997). "Nichols Called Drifter, Devoted Dad". Washington Post. Associated Press. Retrieved April 10, 2010. ^ Pankratz, Howard (August 30, 1997). "Nichols' family speaks out". The Denver Post. Retrieved April 10, 2010. ^ a b c d e f g h i j k l "What brought Nichols to the dock?". The Denver Post. September 21, 1997. Retrieved April 10, 2010. ^ a b c d e f g h Jackson, David; Linnet Myers; Flynn McRoberts (May 11, 1995). "Portrait of a Federal Foe: Authorities Stitch Together Evidence Of Bombing Suspect Terry Nichols' Life That Shows A Failed Farmer And Soldier Who Was Left With Little Except His Hatred For The Government" (fee required). The Chicago Tribune. Retrieved February 28, 2009. ^ Nichols, J. D., Freedom's End: Conspiracy in Oklahoma ( Decker, MI: Freedom's End, 1997). ^ a b Talley, Tim (June 8, 2004). "Nichols' siblings testify in penalty phase". The San Diego Union-Tribune. Associated Press. Retrieved April 10, 2010. ^ a b Denver Post Staff and Wire Reports. "Two Images of Nichols Emerged". The Denver Post. Retrieved April 10, 2010. ^ a b "Letter to Judge Joseph Bonaventure from Terry Nichols". Las Vegas Review-Journal. Retrieved April 10, 2010. ^ Stickney, Brandon M. (1996). All-American Monster: The Unauthorized Biography of Timothy McVeigh. Amherst, New York: Prometheus Books. p. 92. ISBN 978-1-57392-088-9. ^ a b Stickney, p. 101. ^ "WashingtonPost.com: Oklahoma City Bombing Trial Report". www.washingtonpost.com. Retrieved May 27, 2018. ^ Conner, Chance; George Lane (June 29, 1997). "Nichols' wife tells of FBI interrogation". Denver Post. Retrieved April 13, 2010. ^ a b c d e f g h i j k Linder, Douglas O. (2006). "The Oklahoma City Bombing & The Trial of Timothy McVeigh". Famous Trials Oklahoma City Bombing Trial. University of Missouri-Kansas City School of Law website. Archived from the original on February 27, 2011. Retrieved April 10, 2010. ^ a b Romano, Lois (May 28, 1998). "Fortier Gets 12 Years in Bombing Case". Washington Post. Retrieved April 15, 2010. ^ a b Romano, Lois (December 12, 1997). "Nichols Defense Rests Its Case After Jury Hears More From Wife". Washington Post. p. A02. Retrieved April 15, 2010. ^ Toobin, Jeffery (September 30, 1996). "THE MAN WITH TIMOTHY MCVEIGH". The New Yorker. Retrieved September 4, 2015. ^ Romano, Lois; Tom Kenworthy (January 8, 1998). "Nichols Spared Death Penalty". Washington Post. p. A01. Retrieved April 15, 2010. ^ a b c Romano, Lois; Kenworthy, Tom (December 24, 1997). "Nichols Guilty of Conspiracy, Manslaughter". The Washington Post. p. A01. Retrieved September 21, 2017. ^ "Timeline: Oklahoma bombing". BBC News. May 11, 2001. Retrieved June 3, 2018. ^ "Inmate finder". Federal Bureau of Prisons. Retrieved April 10, 2010. ^ A writer who mailed copies of his book advancing conspiracy theories to members of a grand jury investigating the possibility of a larger conspiracy or government coverup was charged with jury tampering in 1999. "Accused of Interference in Bombing, Writer Surrenders". Los Angeles Times. Associated Press. January 20, 1999. Archived from the original on October 23, 2012. Retrieved April 13, 2010. ^ "Deadlock: Terry Nichols saved from death by indecisive jury". Kentucky New Era. Associated Press. June 8, 2004. Retrieved April 13, 2010. ^ a b c Bell, Rachel. "Saved by religion". Timothy McVeigh & Terry Nichols: Oklahoma Bombing. TruTv. Archived from the original on July 24, 2009. Retrieved April 10, 2010. ^ "New OKBOMB Documents Show Threats To Nichols' Family After FBI Reopened Investigation in 2005". ^ "FBI at first dismissed tip on Nichols explosives". Crime & courts. MSNBC. Associated Press. April 14, 2005. Retrieved April 14, 2010. ^ "FBI: Explosives Found in Nichols' Old Home". News archive. Fox News. Associated Press. April 2, 2005. Archived from the original on July 18, 2008. Retrieved April 14, 2010. ^ "Mom: Nichols reveals role in bombing - US news - Security - NBC News". msnbc.com. ^ Serrano, Richard (May 4, 2005). "Oklahoma City Bomber Nichols Says 3rd Man Took Part In Bombing Plot". Los Angeles Times. Retrieved April 14, 2010. ^ Puit, Glenn (May 18, 2006). "Bomber's Letter: 'Clearly Josh is a victim', Oklahoma City bomber sought leniency for son". Las Vegas Review-Journal. Retrieved April 12, 2010. ^ The 2007 statement by Nichols was filed in a wrongful death suit by the brother of a man who died in 1995 while in federal custody. 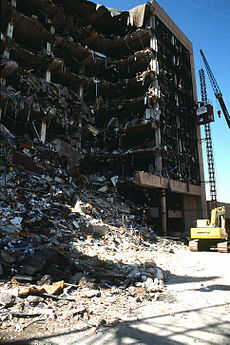 The suit alleged that Kenneth Trentadue was killed while being interrogated by FBI agents in connection with the Oklahoma City bombing, although his death had officially been ruled a suicide. Jesse Trentadue, the plaintiff, wanted to conduct a videotaped deposition of Nichols and one other prisoner to support his contentions that the FBI had killed his brother and was withholding documents related to his brother's death. He was ultimately unable to obtain a court order allowing this. ^ a b c d e Fattah, Geoffrey (February 22, 2007). "Nichols says bombing was FBI op". Deseret News. Retrieved April 13, 2010. ^ "Salt Lake Attorney Can Question Terry Nichols on Videotape". KSL.com. Associated Press. September 22, 2007. Retrieved April 10, 2010. ^ Berger, J.M. (September 21, 2007). "Terry Nichols Will Testify On OKC Bombing". INTELWIRE Terrorism Blog. Archived from the original on January 22, 2013. Retrieved April 10, 2010. ^ Manson, Pamela (July 2, 2009). "Appeals court overturns order allowing deposition of Terry Nichols". Salt Lake Tribune. Archived from the original on July 4, 2009. Retrieved July 5, 2009. Jones, Stephen. Peter Israel. Others Unknown: The Oklahoma City Bombing Conspiracy. New York: PublicAffairs, 2001. ISBN 978-1-58648-098-1. Michel, Lou; Dan Herbeck (2001). American Terrorist: Timothy McVeigh & The Oklahoma City Bombing. New York: ReganBooks. ISBN 0-06-039407-2. "Inside Bomber Row". Time. November 5, 2006.